The site of the former J.L. Hudson Co. department store, is seen Dec. 14, 2017, in Detroit. Ground was broken for a new 800-foot-tall, $900 million two-building project on the site that will include a 58-story residential tower and 12-floor building for retail and conference space. An 800-foot-tall (244-meter) centerpiece is coming to Detroit’s resurgent downtown as the city continues to build momentum about three years after exiting the largest municipal bankruptcy in U.S. history. 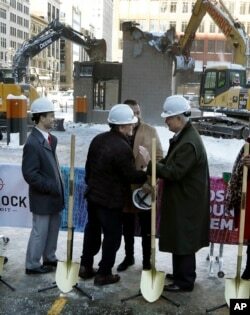 The 58-story building dominating the local skyline will rise on the site of the iconic J.L. Hudson department store, whose 1983 closing epitomized Detroit’s economic downfall. But the bad times for downtown appear to be largely over. Bedrock Detroit’s $900 million, two-building project will include a 58-story residential tower and 12-floor building for retail and conference space. Up to 450 residential units can be built in the tower. Quicken Loans founder Dan Gilbert, center, meets with Joe Hudson, former CEO of the J.L. Hudson Company at the groundbreaking site of the city's new 800-foot-tall building, Dec. 14, 2017, in Detroit. Mayor Mike Duggan’s office has spearheaded redevelopment programs targeting a number of city neighborhoods, but Detroit’s growth is most evident in greater downtown, where office space now is limited and available apartments are tough to come by. A 6.6-mile-long light rail system launched earlier this year along Woodward Avenue, downtown’s main business thoroughfare. “Bedrock building on the Hudson’s site will be an important addition to the community and the vitality and prosperity of downtown,” said John Mogk, a Wayne State University law professor whose work has included policy on economic development issues. Detroit’s unemployment rate was about 8 percent in April, yet far below the more than 18 percent unemployment rate during the city’s 2013 bankruptcy filing. The city’s 2016 poverty rate was just more than 35 percent, the highest among the nation’s 20 largest cities and more than double the national poverty of 14 percent. A family of four is considered living in poverty if its annual earnings are less than $24,563. Downtown construction projects such as the work at the Hudson’s site can help change that, some say. While Bedrock’s new building would be Detroit’s tallest, rising above the 727-foot (222-meter) Renaissance Center along the city’s riverfront, it still would be far shorter than some other U.S. towers. One World Trade Center in New York measures 1,776 feet (541 meters). Chicago’s Willis Tower hits 1,451 feet (442 meters), while the Empire State Building in New York climbs to 1,250 feet (381 meters). J.L. 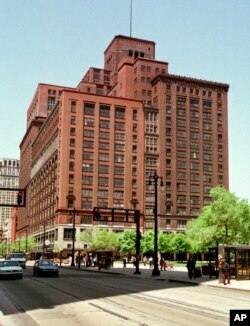 Hudson's department store stands in downtown Detroit, May 31, 1996. The iconic store's 1983 closing epitomized Detroit's economic downfall. Although the 25-story Hudson’s building was once the nation’s tallest department store, it measured only about 400 feet (122 meters). It was far more famous for what was inside. There were 50 display windows, 12,000 employees and 100,000 customers per day. But as shopping tastes shifted to expansive suburban malls and Detroit’s population tumbled by more than 600,000 people between the 1950s and 1980, Hudson’s lost its luster. “Building something of significant magnitude on the old site will provide a good deal of good feelings by older generations,” Mogk said.